Jets Say Favre Lawsuit "Completely Without Merit"
The New York Jets say a lawsuit filed Monday by two massage therapists alleging sexually suggestive text messages from Brett Favre cost them their part-time jobs with Gang Green is baseless. Christina Scavo and Shannon O'Toole sued Favre, the Jets and a Jets massage coordinator in a Manhattan court, seeking unspecified damages for sexual harrassment and job discrimination. On Tuesday morning, the Jets released a statement through their Employment Counsel, Gary H. Glaser, Esw. “Unfortunately, the plaintiffs never reported the allegations to the Jets, either during or after the conclusion of their work," he said. The lawsuit comes five days after the NFL fined Favre $50,000 for not being candid in an investigation into allegations that he sent lewd text messages and photos to a Jets game hostess. Favre has consistently refused to answer reporters' questions about the allegations. 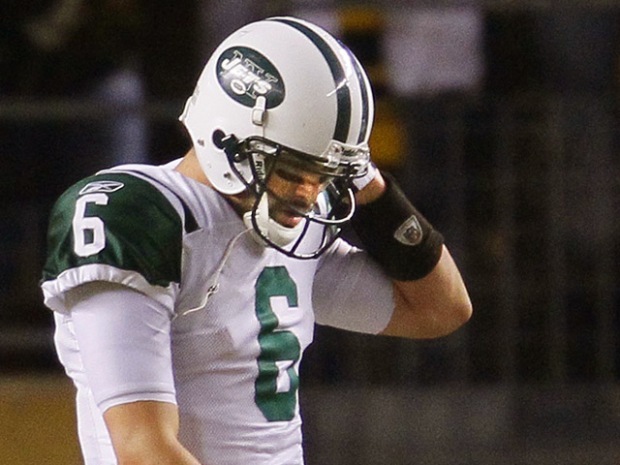 An agent for the veteran QB didn't immediately return a telephone call. The lawsuit says Favre send a third, unidentified massage therapist a 2008 text message asking whether she and Scavo "want to get together." "I guess I have bad intentions," he allegedly wrote. The NFL had reviewed media reports that Favre pursued the two massage therapists who worked at the Jets' facility in 2008, but said that claim could not be substantiated because people with "potentially relevant information" wouldn't cooperate with investigators. O'Toole's and Scavo's lawyer, David Jaroslawicz, said he told investigators about the information his clients had. The two women worked for years at the Jets training camp and for various players individually, sometimes giving massages at players' homes, according to the lawsuit. O'Toole brought Scavo into the Jets fold, Jaroslawicz said. After Scavo and an unidentified colleague gave massages at the training camp in 2008, Favre sent the colleague a text message saying, "Brett here you and crissy want to get together I'm all alone," the lawsuit said. Jaroslawicz declined to identify the massage therapist who allegedly received the messages. Scavo told her husband, Joseph, about the messages. He promptly told Favre to back off and apologize, according to the lawsuit. The husband got a brush-off from Favre, and his wife and O'Toole got blackballed by the team, the lawsuit says. The Jets stopped calling the women for work, initially offering such excuses as having moved the training camp, Jaroslawicz said. After the allegations about Favre chasing Jets masseuses surfaced in media reports, the team's massage coordinator, Lisa Ripi, sent Scavo a series of e-mails calling Favre "a pervert" but ripping Scavo for not having keeping the matter quiet, the lawsuit says. "There are ways to handle things in a professional manner and ways to be compensated not in public. ... All this nonsense is unnecessary," Ripi wrote, according to the lawsuit. "For sure feel horrible that u had to go thru that w a pervert. ... He was wrong on all counts...and we cldve helped u a lot more at that time." Meanwhile, Ripi told O'Toole to "keep your mouth shut" and declared that neither O'Toole nor Scavo would ever work for the team again, the lawsuit says. Jaroslawicz said his clients had held off on suing while awaiting the results of the NFL investigation, but they decided to go ahead after the probe ended in what they saw as a token fine. Allegations about Favre's below-the-belt behavior initially surfaced on the website Deadspin, which posted a video Oct. 7 that included text messages and voicemails allegedly left by Favre for Sterger, including one in which he allegedly invites her to his hotel. NFL Commissioner Roger Goodell determined that Favre was "not candid in several respects during the investigation" but "could not conclude" that Favre violated the league's personal conduct policy based on the evidence he had, the league said in a statement announcing the fine. Forensic analysis failed to establish that Favre sent the objectionable photographs to Sterger, the league said. "Clearly, (the massage therapists) were just as dissatisfied with the NFL's decision as we were. Or lack of a decision, for that matter," Sterger's lawyer, Joseph Conway, said Monday. He wouldn't say whether Sterger was also planning a lawsuit. The league's investigation went on for months as the three-time MVP staggered through his 20th NFL season, fighting injuries as he led Minnesota in a disappointing season. 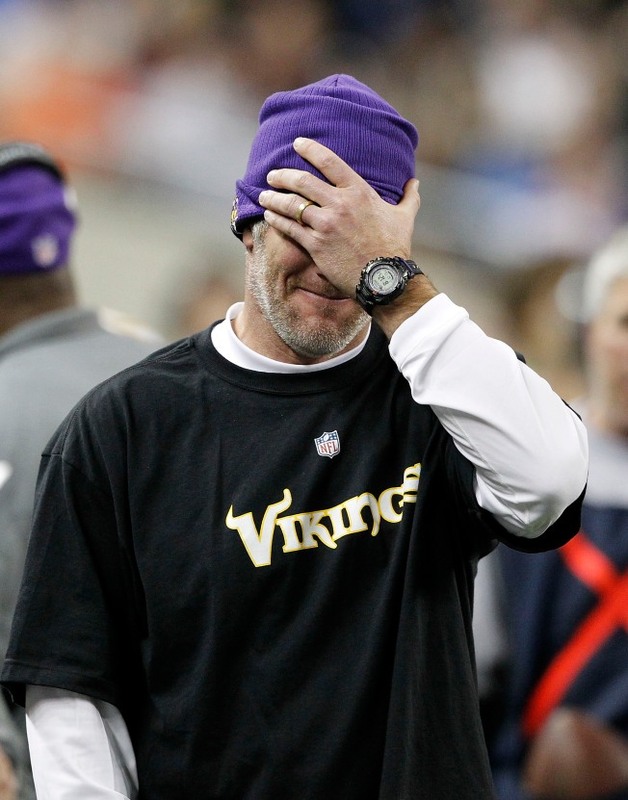 Favre's consecutive starts streak was eventually snapped at 297 in December and he sat out the Vikings' final game, a loss to Detroit on Sunday. Afterward he said he's retiring — for good, this time. While being buffeted by questions about his behavior, Favre also has been battered by injuries to his ankle, chin, ribs, back, head and throwing shoulder — the one that forced the famously hardy 41-year-old quarterback to miss a start, against the Giants on Dec. 13. He sat out Minnesota's loss to the Lions on Sunday because of a concussion and said the game would be his last. Fans have heard that before, however — he also retired in 2008 with the Green Bay Packers and 2009 with the Jets, only to return both times.